Headbands are the hot accessory right now, and can be a great way to add flair and unify your bridal party. Plus, they’re a fun do-it-yourself project! Simple enough for even the not-so-crafty among us, you can also make them as elaborate as your imagination gets. Here are a few DIY headband tutorials that I’ve found to get the creative juices flowing. Gather your bridesmaids together and have a good time with them! This photo is of Gossip Girl’s Serena van der Woodsen, who wore a silver ribbon as a headband to the white party. One way to get this look yourself is by using a metallic silver mesh ribbon. Visit M&J Trimming for more info! Click here for the tutorial at Altered Cloth. All you need is some ribbon and ponytail elastics! Click here for the tutorial from Once Wed. For these headbands, you’ll need ribbon, 2 types of trims, elastic, needle & thread, and a hot glue gun. The headband in the photo below, from Anthropology, grabbed the attention of Forever Chic, and she decided to make one herself, using some leather cords she cut off a vintage dress, and a couple ponytail bands! See how she did it here! The instruction from a headband class at M&J Trimming led participants like the neon tea party and friends to create all sorts of headbands, from glamorous to funky. You start with a store-bought headband, then use your imagination and a glue gun to add ribbons, flowers, and other any other embellishments you fancy. Viola! 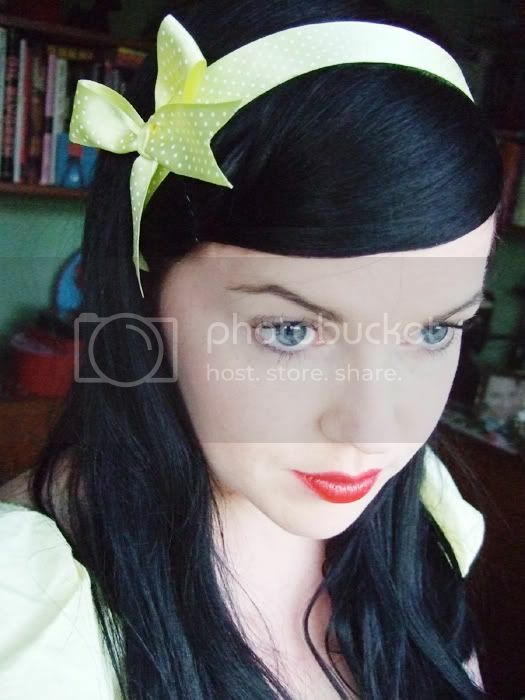 Here’s a super cute headband made by Rascal Kosher on the Crafster community board. You can make your own using ribbon with an elastic band and a button in the back. She used the Crafster Book tutorial, but looks simple enough that you can figure out how to DIY! 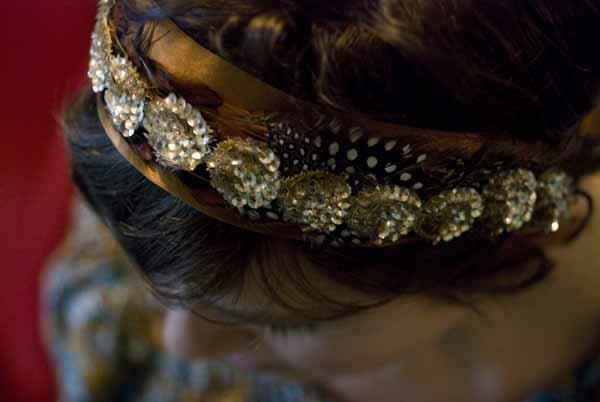 Here’s a gorgeous, glimmering headband fashioned after the headbands at Marc Jacobs. You’ll need some netted metallic fabric, flat-backed rhinestones, and super glue. Take a look at the tutorial here at Fashionista! These are some great ideas!! You can get your bridesmaids together and create so many different styles and use them long after your wedding.